The ninth installment in the Filmworks series on Tzadik in the haunting soundtrack to "Trembling Before G-D", a "documentary about gay Hasidim and Orthodox Jews who 'come out' as gays and lesbians and the ways in which they negotiate their sexuality and identity in religious communities." (From the liner notes by director Sandi Simcha Dubowski). Zorn, whose exploration of the many aspects and facets of Jewish identity in Masada and a lifelong championing of outsiders in many of his other projects, makes him uniquely suited to score the film. However, this is yet another album featuring the Masada songs played by yet another band, and while the results are certainly impressive, they are by no means essential to a record collection. 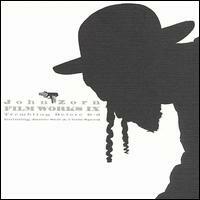 Certainly Filmworks VIII, Bar Kokhba or Circle Maker are better discs to get for the Masada tunes being played by small ensembles, but that being said, this is a beautiful album. Like Filmworks VIII, the act of scoring a film seems to focus these songs, imbuing them with a certain kind of power that the otherwise wonderful Circle Maker lacks. Circle Maker is, strangely enough, the only Masada song album which isn't a sound track at all. While I was never a big fan of the clarinet/organ duets on Bar Kokhaba, some extra element makes them work here. While John Medeski's right hand lines flew around with Chris Speed's clarinet lines on Bar Kokhba, Jamie Saft takes a more laid back approach, adding dark colors and pulses to the clarinet; the lower register of Saft's organ is particularly powerful and hypnotic. This is moody and beautiful music, but by no means essential.